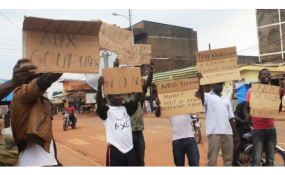 Youths protest against Paul Biya (file photo). Teodoro Obiang Nguema and Robert Mugabe led the pack last year as the longest ruling African leaders after 38, and 37 years in power respectively, followed closely by Yoweri Museveni's 31 years in power. Cameroon's re-elected President, Paul Biya is eying the top spot for the longest ruling African leader with his new seven year term, which could bring his tally to 43 years. The 85-year-old Paul Biya has been re-elected for a seventh term, extending his 36-year rule of Cameroon. The election, which was marred by violence and insecurity, ended on an equally intimidating note as CNN reported that security operatives surrounded the homes of two opposition leaders on the day of the announcement to prevent them from protesting and calling for the annulment of the poll. President Biya has been accused of human rights infringements, especially targeting Cameroon's Anglophone population, which has fuelled a growing secessionist movement. Amnesty International said in a report that 400 civilians have been killed since the beginning of the year in intensifying attacks between armed separatist groups and security forces in Cameroon's Anglophone regions. According to the Corruption Reporting Project, Biya, also described as the "Absentee President", has spent an estimated US$182 million of public money on his private travels. His looting is well documented, with examples of a gaudy palace, a multi-million dollar golf course with ornamental gardens and a runway long enough to accommodate a Boeing 747 built in the village of his birth.